Styletadka's got wacky stationery, graphic tees, designer fridge magnets, luggage tags with cool quotes on 'em, badges and more. Fridge magnets, stationery, gift boxes. We came across Styletadka on one of our random, Internet strolls to find products that make us happy. Their name was what reeled us in, but the products made us stay. We loved scrolling incessantly through their stationery section, where a bevy of printed pocket diaries, fun scribble pads, and a long line of hard-bound notebooks populated their feed. Their badges and fridge magnets didn't really make things easy when it came to choosing just one, but we loved the 'Mah Kitchen Mah Rules' and the travel ones. Don't forget to check out their 90s games-themed coasters for some hard-hitting nostalgia. 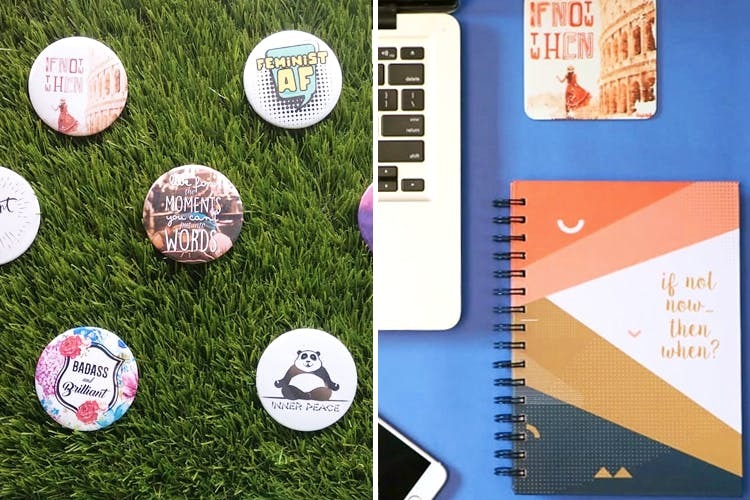 They've also got luggage tags to jazz up your suitcase, planners to give your work desk a facelift, and doodle tees that stand out from a mile out. Some of the designs look repetitive; we wish they'd add some more offbeat ones. They've got a gift box section where they've got assorted boxes based on themes like humour, hustler, lady boss, wanderer and more. Choose these when you can't think of the right present to give your BFF.